For a class assignment, 9-year-old Trevin Allen described his dream of working in plastics at SEKISUI SPI with his father, Lucas, a graduate of Pennsylvania College of Technology. Trevin’s mature goals prompted an invitation from the college, where he experienced various facets of applied technology. From left are Shannon M. Munro, vice president for workforce development; Tom F. Gregory, associate vice president for instruction; and Trevin and Lucas Allen. “It’s interesting to see a person his age articulate what his aspirations are in the future and the need to get an education and that those education pieces are critical to work in whichever career he chooses,” said Shannon M. Munro, vice president for workforce development at Penn College. Headquartered in Bloomsburg, SEKISUI SPI is a worldwide leader in thermoplastics and a major supporter of Penn College. Trevin’s father, Lucas, is a technical service specialist for SEKISUI SPI, focusing on physical property testing. Lucas graduated from Penn College in 2001 with a building construction technology degree. Following several years as a contractor, he transitioned to the plastics field by accepting an inspector/packer position at SEKISUI SPI in 2012. Attending workshops offered by the college’s Plastics Innovation & Resource Center helped Lucas advance to his current position. That dedication to continuous education has resonated with his son. “My dream is to go to college and earn a degree to learn how to work on a computer. I will have to work hard and stay focused,” Trevin wrote. EDITOR’S NOTE: A video documenting Trevin Allen’s visit is available on the college’s YouTube channel. Proudly sporting a name tag identifying himself as a “tomorrow maker,” Trevin spent a recent morning experiencing various areas of the college, known as a national leader in applied technology education. He witnessed the possibilities of computer-aided design by interacting with architecture students working on their projects. A stop in the college’s new makerspace, The Dr. Welch Workshop: A Makerspace at Penn College, prompted him to manufacture a boomerang from a piece of wood with the aid of a bandsaw, drill press and sander. According to the Manpower Group’s 2018 Talent Shortage Survey, 46 percent of U.S. employers are struggling to fill open positions as recruits don’t possess the required skills. Penn College is doing its part to shrink the skills gap, thanks to its 96 percent graduate-placement rate. 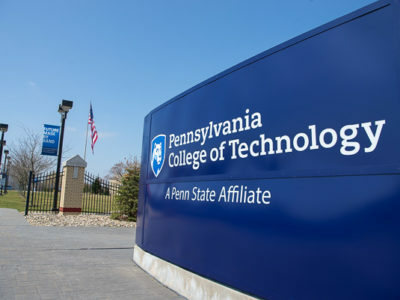 Penn College is one of just six institutions nationwide offering plastics degrees that are accredited by the Engineering Technology Accreditation Commission of ABET. And the college’s PIRC is a recognized leader in plastics education and training. Trevin’s succinct reaction to the college’s plastics labs was “cool,” whether he was touching the powder used for rotational molding, admiring a disk made from an injection molder or watching the thermoforming process. Olivia C. Ferki, a plastics and polymer engineering technology major from Richboro, assisted Wodrig and Christopher J. Gagliano, PIRC project manager, with Trevin’s tour of the plastics facilities. Trevin’s familial connection to SEKISUI SPI also heartened Ferki. She received a $7,000 Student Workforce Development Scholarship from the company. According to Munro, SEKISUI SPI has done much for the college. As one of those graduates, Lucas Allen was humbled by the opportunity to return to his alma mater with a tour geared to his son’s interests. Trevin’s friends should be prepared to learn about the exploration of his dream at Penn College. “He loves to talk. The stories and experience, I’m sure he’s going to be excited to relay, which may spark an interest in someone else,” Lucas said. At the end of his tour, Trevin confirmed his dad’s prediction. “It was the greatest day, and I’m going to tell them every last thing that I did,” Trevin said with a wide smile. Congratulations to everyone for reaching out to this young man and making this experience happen. This is an event he will never forget and sets a fantastic example for other youth to follow.